^ Quickfacts.census.gov - Ziebach County - accessed 2011-12-06. ^ a b American FactFinder U.S. Census Bureau. Dupree, South Dakota - accessed 2011-12-05. 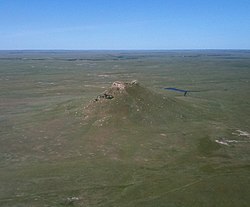 ^ Squaw Teat Butte is the given name of this prominence on the following topographic map of the US Geological Survey: USGS Rattlesnake Butte Quad,South Dakota. See http://www.topozone.com/map.asp?lon=-101.752934&lat=44.892484&datum=nad83 This page of Trails.com has the portion of USGS Rattlesnake Butte Quad, with Squaw Teat Butte.